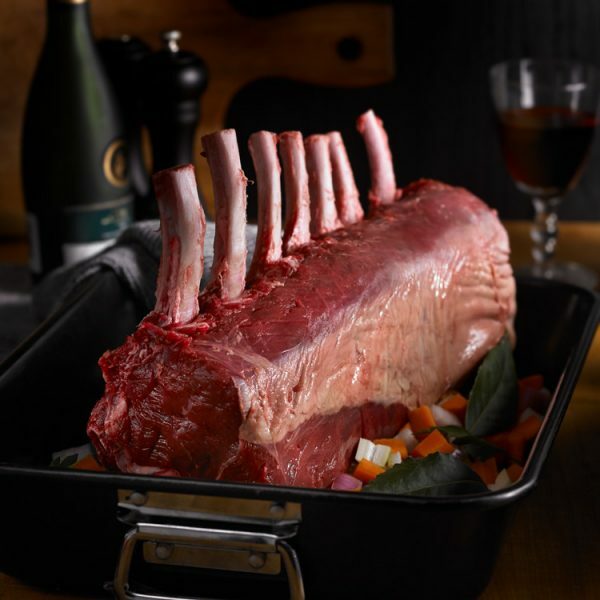 Enjoy the Succulent Flavor of Elk in this Recipe for Roasted Elk Rib Rack. Marinate elk in a mixture of garlic, herbs and oil for 2 to 4 hours. Wipe off excess garlic, season with salt and pepper, and sear in a hot sauté pan. Brown on all sides, then place in a 450°F oven and roast for 10 to 15 minutes or until internal temperature is 130°F. While meat cooks, make Red Wine Sauce (instructions below). When meat is done, let it rest 4 to 5 minutes, then slice each loin between each bone into 4 slices and sprinkle with a bit more salt. Fan out loins on a plate and drizzle with wine sauce (excess sauce can be served separately). Serve immediately. Pour 1 to 2 tablespoons olive oil in a medium sauté pan and heat for about 1 minute or until the olive oil looks hot and glassy. Immediately add elk trimmings, carrot, celery, onion and garlic; cook over medium-high to high heat until caramel color develops. Pour red wine into pan and scrape the flavorful brown bits as they become cooked onto the pan. Reduce heat and simmer until reduced by three quarters.